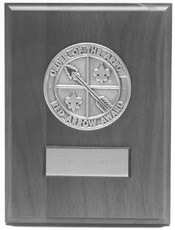 The Red Arrow Award is presented by the National Order of the Arrow Committee at a National Order of the Arrow Conference (NOAC). The recipients are either non-Scouters or Scouters who are not members of the Order of the Arrow. Their service takes many forms and involves a significant period of time, as opposed to a single event.